Sorana Cirstea avenged her previous two defeats by Samantha Stosur to give Romania a perfect start. (CNN) -- Hopman Cup hosts Australia suffered a shock defeat in the opening match of the mixed teams tennis tournament in Perth on Saturday, losing 2-1 to Romania. Teenager Sorana Cirstea upset Samantha Stosur 3-6 6-4 6-3 in the opening singles rubber to register her first victory in three clashes with Australia's world No. 13. The 19-year-old, who lost to Stosur in the quarterfinals of the French Open last year and in the semifinals in Los Angeles, won the last three games of the deciding set to clinch victory. Former world No. 1 Lleyton Hewitt leveled the tie with a battling 3-6 6-3 7-6 (7-2) victory against Victor Hanescu, but he and Stosur then lost the mixed doubles 7-5 6-1 as Romania claimed the win against the tournament's top seeds. "It's always tough. I hadn't played really for three months." Hewitt, who has been recovering from hip surgery, told the tournament's official Web site. "The first match of the New Year was always going to be tough. Victor's an extremely tough player and he loves dictating play from the back of the court. "He was hitting these serves extremely well close to the line, so it was hard for me to get in a lot of rhythm against him, but I'm glad the match went to three sets because I got better as the match went on." 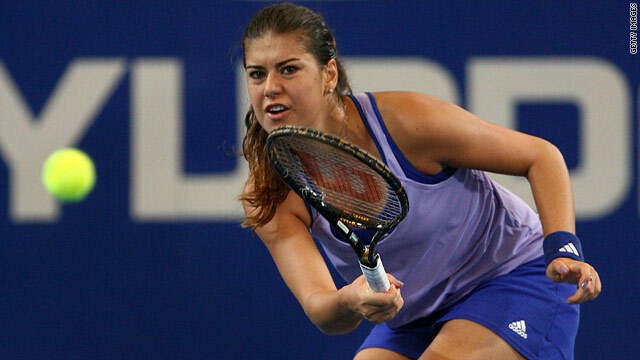 Cirstea, who ended 2009 ranked 45th in world, was delighted with her win against Australia's top female player. "It got better and better and the crowd got better and kept me motivated. She was serving unbelievable, and for me one of the main focuses was to make one break," Cirstea said. "I just needed to make one break out there and keep my serves. At one point I had nothing to lose and I'm the one coming from behind, so I just needed to enjoy it." The other teams in Group A, Spain's Maria Jose Martinez Sanchez and Tommy Robredo plus the United States pairing of Melanie Oudin and John Isner, will meet on Sunday. The Group B matches start on Monday, with the second-seeded Russian duo of Elena Dementieva and Igor Andreev taking on Germany's Sabine Lisicki and Philipp Kohlschreiber. Also on Monday, British third seeds Laura Robson and Andy Murray face Kazakhstan's Yaroslava Shvedova and Andrey Golubev.